Tata Motors has just launched the highly anticipated Zest compact sedan in India. The sub-4 meter car is the latest addition to India’s burgeoning compact sedan segment, which will see more additions in future in the form of the 2015 Ford Figo-based and the Volkswagen PQ25 platform-based compact sedans. 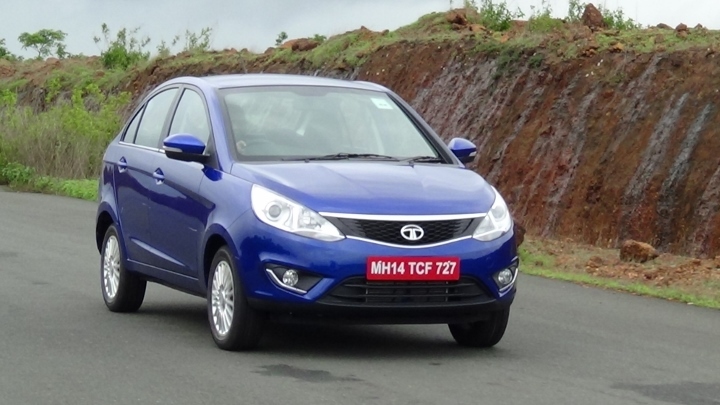 With the Zest, Tata Motors has once again delivered value in a large heap. Introductory prices start from 4.64 lakh rupees ex-showroom Delhi. In terms of design, the Zest assumed a compact form of under 4 meters, with a stubby boot rounding off the rear. Based on the X1 platform, the Zest gets a completely new top hat with sharper design cues meant to give the car a sportier appearance. Projector headlamps up front and wraparound tail lamps give the Zest a distinct look while the 15 inch alloy wheels fill up the wheel wells nicely. The Zest comes with turbo petrol and turbo diesel engine options, and is also the first Tata car to feature a turbo petrol engine and an automated manual transmission. The petrol motor is the newly developed, 1.2 liter-4 cylinder turbocharged engine that makes 89 Bhp-140 Nm. The petrol motor gets an ECU with three different drive modes, Eco, City and Sport. A five speed manual gearbox is standard with the turbo petrol motor engined Zest. The diesel variant of the Zest uses the tried and tested, Fiat 1.3 liter-4 cylinder Multijet turbocharged motor, available in two states of tune, 75 Bhp-190 Nm (fixed geometry turbocharger) and 90 Bhp-200 Nm (variable geometry turbocharger). The engine uses a 5 speed manual gearbox as standard while a Magneti Marelli designed 5 speed automated manual transmission is offered as an option, giving the Zest a class leading feature. The Zest gets driver focused ergonomics in the form of the dashboard and instrumentation design oriented towards the driver. Fit and finish levels have been ratcheted up on the Zest’s interiors, making it one of the better finished Tata cars in recent times. A touch screen infotainment interface with integrated climate control and Harman stereo functions makes the Zest one of the best equipped cars in the Indian compact sedan segment. The car is available in ten variants, five in petrol and four in diesel. The five variants of the Zest Diesel are – XE, XM, XMA, XMS and XT. The petrol powered Zest skips the XMA F-TRONIC automatic variant. The XE variant of the diesel uses the 1.3 liter Fiat Multijet turbo diesel engine in 75 Bhp-190 state of tune. Top-end variants of the Zest get twin airbags and ABS+EBD.